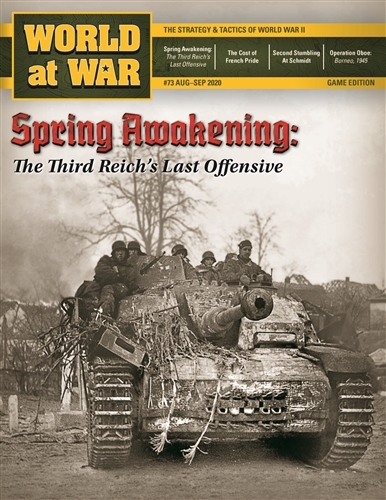 Spring Awakening is a two player wargame of Operation Fruhlingserwachen, the final major German offensive of World War II. The German plan was to launch a two-pronged attack to secure a defensive zone for the Lake Balaton oilfields in northern Hungary. The offensive failed in the face of Soviet resistance, and the ensuing Red Army offensive swept into Vienna. While historically, the situation was dismal for the Third Reich, the objective is for players to do better than their historical counterparts. Each side is divided into two sub-commands. For the Axis, this includes the Nord Armee Kommando and Sud Armee Kommando, for the Soviets, the Third Ukrainian and parts of Second Ukrainian Fronts, as well as a Bulgarian army and a Yugoslav corps. 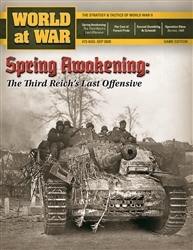 The scenario starts on 6 March 1945 (the opening of Spring Awakening) and carries through to 16 April (following the Soviet capture of Vienna). Each game turn represents one week of operations. Each hex is 18 kilometers across. Most ground units are corps, representing two to five divisions.